FAQWe collected the most frequently asked questions below, enjoy!! page but can’t find specifically my query. I want to patch old door hinge screw holes with your turbo bog, which I love by the way….but I’m not sure how to get it in there! The holes are about an inch and a halfway deep and about about 8 ml wide. I’ve been told a syringe won’t work due to the plunger deteriorating and potentially affecting the bog. It’s a fine deep hole, can you please suggest an effective way? I fear using a spatula just won’t get in there. Thank you for a most interesting question. As you say, the thixotropic, non-slumping properties we built into Builder’s Bog prevent it from being spatula’d into small holes. The way I do this is to use a piece of steel rod or wood just smaller than the hole and poke the Builder’s Bog into the hole bit by bit. Not a fast operation, but the only way I know of to fill the holes. If there are dozens of holes, I have used a short pierce of drinking straw jammed onto the spout of a small squeeze bottle (or just the spout itself, if long enough). I fill the bottle with the Bog mix and squeeze it down into the holes through the spout. Then you have to throw the bottle away. They can be bought cheaply from plastic retail shops. Another quicker fix is to coat matches, or kebab sticks, or wood dowels (depending on the size of the holes) with the Bog mix and drive them into the holes. Cut off the excess with side cutters or a hacksaw, and sand down with 80 grit in a palm sander when cured. Thank you so much! A couple of brilliant ideas there. I’ll give it go today, this door has been stuffed for months! I’m really pleased that you took the time to reply to me personally, this is the best customer service I’ve recieved in a long time. I’ll send you some feedback on how I go with it. Thanks again Stuart. Thank you for a most interesting question. Turbo Concrete Bog differs from Builder’s Bog in two major ways. Concrete Bog is a lot heavier than Builder’s Bog, so if measuring hardener ratio by weight, Builders Bog needs 1 gram red hardener to 40 grams of putty at mid point. Concrete Bog needs 1 gram white hardener to 50 grams of Concrete Bog. You can halve or double this amount of hardener paste in each product, depending on how fast you want them to gel and cure, whilst still attaining the right final hardness etc. By volume, which is how most people will measure the ratio, I suggest to select the quantity you need for the repair, then split this quantity needed into cup sized portions (250 Ml.) on the mixing board, then add the requisite amount of white hardener – in the case of Concrete Bog 1/2 to 2 level teaspoons of hardener. For Builder’s Bog the directions cite a matchbox full which is 30 Ml, so there are about 8 of these in a cupful. Again split into matchbox or cup-sized portions and dose each portion with the amount of red hardener according to the directions. Then either mix the portions one at a time or mix them all together, and you will have the correct ratio for your repair. This is easier I think than trying to estimate the number of cups or matchboxes in contained in a large quantity. The red hardener is easy to see when fully mixed and the stripes are all gone. For concrete Bog you have to be more thorough because we cannot use a coloured hardener and still have concrete-coloured repairs. I hope this helps. Absolute accuracy is not important since the permissible variation in hardener ratio is formulated to be very large in our product. Thank you SO much for your very informative reply. I will let you know how we go. Hello Mary,Thank you for a most interesting question. Turbo Concrete Bog differs from Builder’s Bog in two major ways. Just wondering if this product can be applied over itself ? Greetings,Thank you for a very good question. Builder’s Bog is based on Polyester resin. The polyester curing reaction is inhibited by contact with air, therefore we put in an additive which excludes air from the outer surface as it cures. This additive must be removed by sanding, scratching, roughening etc for a perfect bond between layers.Successive wet-on wet applications are not a problem, because the “waxy” surface only forms after curing. If the surface is hard to reach for sanding, I would attack it with a chisel, broken drill bit, rotary burr or similar in order to expose a bit of the under-surface for a good bond between layers. As you can see this is a good question, well worth asking! Hi guys/gals, can Turbo builders bog be tinted/coloured in any way? ie. either with oxide or paint or paint tint? Hello Greg,You can indeed colour Builder’s Bog with dry oxides, such as used in concrete etc. Paint tinters may sometimes work, but often will interfere with the chemical cure mechanism, so I never use them.Oil based paint itself can produce paler shades, but any more than about 2 to 5% addition will spoil the end cure too. for the bog to sit in to fix it BUT NOT STICK TO IT. Can I use grease to stop it adhering to the metal (temporary) framework. Thank you for your enquiry.You have not specified which TURBO product you are asking about. We have a new one not launched into NZ hardware yet, but going very strongly in Australia called TURBO CONCRETE BOG.This would be good to repair a bird bath. It is a 2 pack like Builder’s Bog and Body Filler, but contains sand so is abrasive and not good for chiselling sawing and filing. But it looks just like concrete when set. It comes in 1 litre and you could get a can directly from us for cash $30.00 if suitable before it reaches NZ hardware stores later this year. Otherwise either of the other two products mentioned will do the job. For a release coating I always use a paste furniture wax, not grease. Grease, being more sticky, might dissolve in the filler somewhat before it hardens and leave a softened surface. I am not sure on this, though, because it has not been tried here. Mould release waxes also work, but are not much different from paste furniture waxes in this application. Thank you I very much appreciate that. I will need to smooth it afterwards so perhaps the concrete bog might not be best? Can I use builders bog instead because I know that can be smoothed. Sorry to bother you again. Sorry for the late reply. I had a terrible ‘Flu and have just returned to work. Hi. What product do you suggest to repair/fill a small car door hole and dents? I have builders bog but I guess that is not recommended? Hello Mike,Thank you for your email. You are correct that Builder’s Bog is not the correct material for car body dents. It is specifically formulated to react with and stick to timber cellulose and sets no harder than timber. So adhesion to steel is not optimal. And it is not really tough enough for a car paint finish. I have been trying to use some Newtech filler in a car. My problem is that the mix of activator to filler may be too low and the Newtech won’t set. At first the Newtech was setting too fast like in 3 or 4 minutes. So I used less activator. It seemed to be setting and hardening, but now several hours later it has still not set or hardened properly. What can I do? Will it harden if I wait long enough? If so how long? Lets say the ratio of activator to Newtech is 1 to 100 for example. Will that set and harden eventually? Or do I need to attack the filler I have put in and try to remove it and start all over again? That would be very difficult. I seem to have a complete stuff up at the moment. Will the Newtech at a 1% ratio of activator to filler harden eventually? There is no information on the internet that I can find discussing this problem. Can you give me some advice please? Hello There,Newtech repairer will Gel in anything from 4 to 10 minutes, depending on temperature and amount of hardener used. At higher temperatures, as we have this summer, there is a temptation to use hardener well outside the ratio range we specify, which is 2 to 3% by weight. Cure will be sufficient from about 1.5 to 4 % by weight, but outside this range becomes influenced by temperatures, and at 1% and below 20 Deg C may not take place.There is another factor which comes to mind. The red hardener contains 20% water to make it safe. When stored at temperatures above 25 Deg C for long periods (more than a year or two) some of this water may separate out as a red or milky liquid on top of the red paste. This water is inactive and should be discarded before using the hardener. Since this is an age and storage fault and there are many other factors like this that can affect the product, we cannot fit them all into the directions on the can. They would be very rare occurrences and I have never been asked about this kind of thing since Newtech was invented 30-odd years ago.But I wonder if something like this applied in your case? From what you say, I doubt if the product will now cure sufficiently, and I am fairly sure you have less than 1% by weight of active hardener in your uncured mix. I have just asked our laboratory to try 0.75% red hardener by weight at today’s temperature too see what happens. I will let you know. Just wondering if you can help? I’ve used the Builders Bog to fill a gap in wood which I want to paint but obviously haven’t added enough red hardener because 2 days later the bog is quite firm but not rock hard yet. Can I still paint it now? Will it eventually dry rock hard? Or do I have to dig it out and start again? Hello Carolyn,Thank you for enquiring. Builder’s Bog does not go “rock hard”. That would be far too hard for a timber repair and impossible to pare and sand down level.If you can indent the repair with your fingernail, as you can do to pine timber, but not actually dig it out with your nail, it will be hard enough to paint. But if too soft due to lack of hardener, the only recourse is to dig it out and try again. The colour should be a medium pink before sanding and lighter when freshly sanded and powdery, returning to medium pink when wetted. It will not eventually cure properly if too little or too much red hardener is used I am afraid. Hello, I’m a painter in Australia and have used Builders Bog successfully many times for timber repairs prior to painting but I have a problem that I haven’t come across previously. The job is painting a new treated pine picket fence – the pickets are fixed with galvanised metal screws to metal shs rails. I have recessed the screw heads below the surface, filled with bog, sanded smooth, primed with oil based and then two coats weathershield. After leaving the job for only a few days due to rainy weather I returned to find the filled areas have ‘divoted’ or appeared as sunk below the timber surface. The paint coating was intact but the previous smooth surface was now pockmarked where the screw heads were. I have now refilled, resanded and repainted and am hoping for no repeats. Can you shed a light onto what went wrong and how to prevent it? Is it the case of the timber expanding around the filler due to rain? Or maybe the metal rails heating up in the sun and transferring heat to the screws and shrinking the filler a bit? Hello David,We see this in fine furniture – piano, guitar and coffin work where it is necessary to stabilise the timber at the humidity it will be constructed at for a week or more.Further, the screws must have clearance holes driven in the outer member and pilot holes in the threaded member. Otherwise what happens is the Builder’s Bog fill is flushed off by sanding, and then the ambient humidity rises, the wood swells around the inert filler and the carpenter swears the Bog has shrunk. The movement is exacerbated by the compressed fibres around screw heads driven straight into the timber without pilot holes – as you would do on a fence batten. Obviously the piano procedure cannot be done for an outside fence and you are limited in appearance by the natural expansion and contraction of timbers as the climate changes. This is not normally noticed or criticized for a fence and the only solution I see is to use pickets like fibre cement board and steel posts if it is not acceptable. By doing it twice you may have minimised or eliminated the problem. to then treat with an anti fungal solution. Is this necessary when using your Builders Bog? Would appreciate your reply. Hello Alan,Any active spores in wood surrounding the repair will continue to rot the surrounding material if you do not kill them. Since some antifungals will interfere with the Builder’s Bog curing chemical reaction and the bond to the timber, I advise you to scrape, chilsel, or cut out all softened wood back to sound timber, then perform the fill with Builder’s Bog.Then drill some holes above (if a vertical surface) or around the repair, inject (squeeze bottle with spout etc) a water- or glycol-based antifungal solution that will soak into the surrounding timber. Then plug the holes with dowels and smooth over and paint. This is the only way to be sure you have inactivated further rotting from fungal spore left behind. I cannot tell you what brands to use since this depends on what your local stores stock, but anything mentioning ethylene glycol and/or boron or borax or boracic acid will work well. Things like Metalex, naphthenates and “wood hardeners” are surface coaters and will not penetrate enough to reach surrounding spores. Plus they cannot be applied before the fill because they will spoil the bond to the timber I hope this helps. Hello Stuart, Many thanks for your reply to my e-mail and on the same day. This was excellent service especially the detailed description on how to repair my problem. I have always used your product as it is the best on the market. a thin layer of Builders Bog. Will this product permanently adhere to ceramic quarry tiles (they look to be a 1970’s style) and withstand light foot traffic? Hello Chris, Builder’s Bog is primarily meant to adhere to timber by crosslinking with the cellulose in the fibres. In general, polyester resins (which are what Builder’s Bog contains) are not strong adhesives when compared with things like epoxies, urethanes etc. Therefore, because of these two facts, I do not think your proposed method is the best one. A two-pack epoxy prime coat would give better adhesion in my view. A good moisture cure (single pack) urethane paving paint should give ample adhesion to quarry tiles, and this is what I would apply. Durapave used to be such a product, but I note they changed the formula to an alkyd enamel some time ago. This would probably not work as well. I would phone a paint company to enquire about epoxy or urethane primers. Hello Pete, Builder’s Bog should be applied direct to timber, not paint. There is a good chance that the cross-linking agents in Builder’s Bog will soften the paint, and then there will be a poor bond between the two. 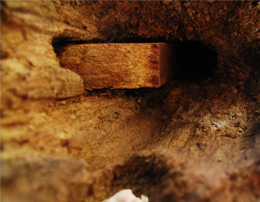 You should make sure that all rot is removed before filling, otherwise spores remaining in the surrounding timber will continue to rot the wood around the repair. If in doubt, drill small holes in the surrounding area and inject an anti rot material into these to permeate the timber. Then fill the holes. If using a water-based anti rot, I suggest driving plugs into the holes (dowels) and then sanding flush before painting. If you are confident you have removed all the rotted timber this step is not necessary. Managing Director, Chemical Specialties Ltd.
had it very pink in mixed colour and it still would not go off. I bought it from a small hardware with low turn over – does builders bog and or its hardener have a shelf life? The weather wasn’t a factor 20 degrees and dry. Please help as I have lost faith in the product. Hello Doug, Firstly, I am sorry to hear you are having this problem. Builder’s Bog is made in a batch process with 1000 to 2000 litres in a mix. Each batch is then tested and adjusted for gel time at 22 Deg C in a water bath using 40 grams of product and 1 gram of red hardener. Gel times controlled to 6 to 7 minutes by adding various accelerators or decelerators as required. That is enough history, but this does make it hard to explain your problem. Relative to shelf life, as the product ages (up to 5 years or more in our tests) the gel time gets shorter and shorter until the material in the can is finally too stiff to use. Eventually it becomes a solid. This is the opposite to the problem you are having. If you add too much hardener (i.e. beyond the limit we specify on the can) the product will not cure, and neither will it with insufficient hardener again beyond the lower limit we specify). This may or may not help you, and I fully realise that no-one wants to hear that they did not follow the instructions to the letter. But in a complicated product where very specific chemical reactions are involved, the ratios are very important. So I suggest that you try out a portion using an old spoon for the hardener (a level teaspoon should hold 5 ml. if of “normal” size). This is 6 grams. Then estimate, or -better – weigh out 240 grams of the paste and mix with the hardener. This will gel in about 8 minutes or less at 20 deg C, depending on how old the sample is. It cannot be more, because we set the Gel time of every batch after manufacture and it never varies except by ageing. I hope this helps. Please email me to let me know your results, since customer responses are very important to us. Thanks Stuart for the quick response. I have gone and tried your suggested mix rate and yes it works and works well but I now see what went wrong. I am a tradesman aged 63 but really only working as a handy man in the last 8 years. I had never used builders bog before (I previously used spakfiller type products and long time ago plastibond). So I bought a 2 litre container at my local small hardware shop. Yesterday very carefully read the instructions and very carefully got the quantities correct(worked with scientists for 30 years). BUT today I poured out the hardener with my reading glasses on and thought gee this is really very liquid like when I did it yesterday but then as I looked at the hardener container closely I noticed that the hardener has completely separated into two substances – one half longitudinally along the whole container a very hard paste and the rest a very liquid liquid. I have reread the instructions on the tin and nowhere does it say reconstitute an evenly thicksatropic(see even if I can’t spell I did work in science) substance within the hardener container before use. I did this and it worked. Clearly sitting on its side on top of the tin in the plastic top over along period in a non air-conditioned hardware shop the hardener separates and if you have never used it before and don’t look closely(at arms length it looks full of red stuff) you seek and get a red hardener out – nothing says anything about the possibility of separation. Not very happy but concede that had I looked closer I would have noticed – guess my plastibond experience yonks ago had me thinking liquid red stuff = ok. The next question is the job I did yesterday using the correct amounts but only liquid form hardener ever going to harden? The client is away for 10 days. If I could offer constructive advice then you need to cover the possibility of separation in your instructions. Dear Doug, Thank you very much for replying, which is most helpful to us. I had not even considered the hardener may have seperated. This normally takes many years unless stored at high temperatures. The red paste contains 18% water dispersed with a detergent in the “oil” phase. The oil phase contains the benzoyl peroxide hardener as a fine powder and an ‘oily” vehicle to make it into ma paste. The water is in there to make the product stable, as otherwise it can decompose suddenly as the temperature is raised. I will immediately review our procedures and check old hardener sample at our factory (we keep samples of all components for 5 years minimum to observe shelf life. Incidentally, many years ago Plastibond was my brand in NZ. I sold the rights to Selleys in the late 70’s. At that time it used an MEKP liquid hardener, so no wonder this red stuff confused you!. I do apologise and suggest it would be good to return the hardener and change it for newer stuff. You can show them this email if you wish. I formulated Builder’s Bog many years ago (I am 69) and many older products before that. I am afraid that the job you did with the white separated liquid will never cure and needs to be scraped out. Also, please be very sure all rot spores are removed or neutralised from surrounding timbers, since I have seen many cases where the Builder’s Bog repair is the only bit remaining – the timber around it having continued to rot. Hi there, the Newtech filler is great but there is no information on the drying time can you help? Hello Ian, Newtech repairer doesn’t involve any “drying” action. It polymerises chemically (“cures”) and we set the Gel time to 7 to 9 minutes at 22 deg C using 2 gm hardener to 50 gm Newtech for every batch we make. Any variation in temperature or hardener ratio will change this. After gelling, full cure takes another 10 hours approx., but Newtech is mostly fully cured after about 1 hour. Varying the hardener and/or temperature can vary gel time from about 3 minutes up to about 15 minutes and 80% full cure from 20 minutes up to 90 minutes. Any gel or cure times outside this range will be due to either too much or too little hardener or a temperature below about 12 deg C, and the final properties will never be achieved. I hope this helps. product bog in a slightly thinner form than it is in the tin. I think that acetone might do the trick but am concerned that that might affect the product’s ability to set hard. As such I wonder if you could advise what I could use to create a bit more fluid a mix without affecting its after setting hardness too adversely. Hello Allen, I am sorry about the delay in answering yoour question, but I have been unwell for a few days. Builder’s Bog contains no solvents. Acetone will thin it, but it will become trapped in the cured matrix and take a long time to escape – weeks, months or never, depending on the tickness of the casting. It will also degrade the cured properties somewhat (mainly soften them). It can be thinned with a polyester resin. but again only a small quantity can be added, because the resin in Builder’s Bog is different from those used in fibreglassing (MEKP-cured), which are the only types you can buy from a fibreglass shop. In about 3 months time we will have a Turbo Fibreglass Repair Kit on the market in Australia, and the resin for this kit will use a liquid form of the BPO hardener we supply for Builder’s Bog. This resin will be available in 250, 500 and 1 litre cans and will do the thinning job admirably. I hope this helps. Please keep in touch if you need further information. Hello Norman, Builders Bog will certainly fill the hole and be strong enough to support the riser. But, depending on what you make the riser of, there may be a leak at this joint with the filler. Polyethylene pipe will not seal to anything, PVC will be OK, copper is hard to adhere to and may need a smear of sealant after the Builder’s Bog is applied, because it may inhibit the cure of our product where is contacts the copper. My fountain uses polyethylene riser pipe , but I pushed it through a tight hole in a large rubber bung which is, in turn, inserted tightly into the concrete fountain bowl. Hello Norman, Thank you for your enquiry. Many years ago we had a problem in Australia wherein a swimming pool complex with a lot of free chlorine in the air experienced some kind of cure failure with Builder’s Bog. It was 20 years or so ago and I cannot recall the details, but it does make me cautious to recommend Builder’s Bog in a working pool environment. Tanalith H3.2 uses CCA impregnation -chrome/copper/arsenic salts. These heavy metals, especially copper, can retard the cure of Builder’s Bog too. So I cannot recommend our product in this application, unless a test is done on a small patch -applying the product, allowing it to cure and then testing the adhesion by attempting to peel off with a sharp blade. If the product cures and there is strong adhesion, then there will be no problems using it. Sorry I cannot be more definite in this instance. I am considering using Builders Bog to repair small chips in ceramic tiles. Largest is about the size of a 10 cent piece and maybe 1 mm deep. Others are tiny. Can I use BB for this? If so, is it possible to colour the BB to match the tile prior to using? Thanks for your advice. Hello Gerard, Thank you for considering our product. Builders Bog sets no harder than timber, so I feel it will probably be too soft to repair ceramic tiles – depending on he forces and wear the repair will be subjected to. You would also have to obtain white BPO hardener paste in order to match colours. Builder’s Bog is supplied with red hardener in order to ensure thorough mixing always takes place. I feel you would be better off starting with a white marine-grade filler designed to repair boat gel coats etc. These are also polyester putties, but sets much harder and uses colourless MEKP liquid hardener. A ships chandlery or boat shop should stock one. Good afternoon, I am about to use your Turbo Builder’s Bog and would like to know the mixing ratio by weight. Good day Mike, thank you for the mail. TURBO BUILDERS BOG has been successful in the market since 1983 and in those days matchboxes were more common than today, so your question is very valid. We suggest 2.5g of hardener to 100g of TURBO BUILDERS BOG. That should give you a 7-odd minute working time at 22 oC. Increasing the hardener will reduce the time before the putty starts gelling, and reducing the hardener concentration will increase this working time before the putty starts to gel, as one may require on larger jobs. Thank you for using our product and best of success! General Manager, Chemical Specialties Ltd.
Dear Sir or Madam, I have been reading spec sheets for builders bog and I have 2 questions about the product. 1. If being used to fill holes in timber weather boards is a backing behind the hole required to stop the filling falling through into the framing at a later stage? 2. If the sides of the holes in the weather board are soaking wet when the bog is being used will the bog still adhere satisfactorily to the timber? Should the timber be left to dry? Please ring me on my direct dial if you wish to ask any questions. Dear Thomas, Thank you for the questions, both are good questions. 1. No, the Turbo Builders Bog will stick once cured, the backing is only required initially when you need a base to apply the wet putty to, before it starts curing. Turbo Builders Bog has been designed and modified over 20+ years to hang up well, but if the hole is too large, that is when you need the backing plate. 2. It is critical that the timber is totally dry. The moisture will interfere with the curing reaction and an inferior product will result which will not cure properly and cause major problems. Very important is for you to dry the weather board as dry as possible. Either by heater (watch out to set it on fire!!!) or by placing a strong lamp (creating heat) close to the weather board. Good luck with the repair!! Hi there, I need to quote for a number of repairs to timber windows as per the attached photos. Will your Turbo builders bog be suitable? If so, where can I get it and what is the price? Also any other info re coverage rates, other tools or materials I would need to allow for. We are in Christchurch. Hello Merodie, Builders Bog will be very suitable for these repairs. The thing to watch is that you don’t leave any spores from rot in the adjacent timber. If you do, and don’t take some action to kill them, the timber will rot again around the Builders Bog and the client will not be happy. So, either remove sufficient timber to ensure there is only sound timber left. Or drill some holes around the repair and implant anti-rot slugs and then fill the holes with more Builders Bog. The slugs are boron compounds usually, and will ensure no further problems. 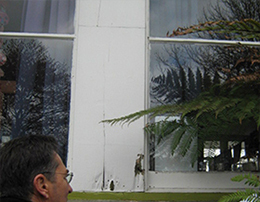 The latter solution applies to large repairs where there is so much damage it is not feasible to access or remove all rotted timber. As part of our on-going development of Builders Bog we repaired, about 4 years ago, a large picture window (4 metres by 2 metres in 2 smaller and one large pane) which faced the sea and was so badly rotted it took 12 litres of Builders Bog, plus timber packing pieces, to fill and repair it. We drilled holes afterwards and injected a solution of boron compounds in glycol. Then we plugged the holes with dowels and sanded them flush (Builders Bog would not have stuck to glycol-wetted timber), and painted the job (all on the same day). Quoted cost to replace the windows was $7500.00. Cost of the Builders Bog at retail would have been $240.00 at the time of the quote and time taken by one person (my son while I videoed it) 5 hours including painting and cleaning up. We fixed the header flashing which leaked and caused the rot and the repair is perfect and undetectable today. Bunnings are the major stockist in Christchurch, and you will have to get the price from them. I cannot help ypou with amount needed since it depends entirely on the volume of the holes you create in hacking out any rot. But from your pics it looks like one or two litres would be ample. It comes in 250 ml, 500 ml, 1 litre and 2 litre cans. Some Acetone to clean up with would be good, though petrol can be used (less effectively) and a metal spreader can the be used to apply and then to to carve “(plane”) back the Builders Bog at the “cheesegrating” stage. – or a Surform file can be used. Use 80 grit paper to rough sand and 120 to finish. A palm sander is handy, but finishing to shape is incredibly easy and quick with our product, even by hand using a sander block. The repairs you show are quite small an should not take long at all. You can finish-paint within a couple of hours of applying the Builders Bog if you use the correct hardener ratio to give about a 20 minute pot life. Hello Clare and Maurie, I am sorry for the delay in replying. I have been off work with a virus. I too am a Senior! A matchbox hold s about 30 Ml. A breakfast cup holds 280 ml, a standard US cup is 236 mls and an Imperial standard cup is 250 ml. So a 1/4 cup is about 2 matchboxes full. a golf ball-size of paste is about 30 ml too, but this is an English golf ball. A US golf ball is way bigger. It is very hard to know how people will assess volumes, but the volume % of red hardener should be 2% of the paste and the weight % should be 2.5%. The difference is because the paste weighs much less per gram than the hardener. We have built in a huge margin for error in Builders Bog, so if you get it wrong it will not matter too much. But it may gel faster than you want if you use too much hardener, and if you really go too heavy with the hardener it will not fully harden ever. Having said this, you may wonder why you just don’t use a single pack product and just let it dry naturally. But, having applied a decent thickness of a water- or solvent-based filler, and then finding you have to wait several days for it to dry throughout. And then having to apply more and wait even longer, because the first lot shrunk – you will be converted to the two-pack, instant through-hardening, quick action concept of Builders Bog. I hope this helps. Feel free to ask me more questions if you wish. I will reply more promptly, because I am now back on deck. Hi Bob, The instructions for this product, which I understand Chemspec produces, do not really explain some aspects of its use. 1. I need to get the longest working period before the product dries so I will add very little of the hardening compound. 2. Does adding this sort of minimum amount of the red hardener lead to a less strong bond? If so what is the minimum amount of hardener that will give proper strength to the finished product after it fully dries? 3. If I mix say 250ml of the product and add a very small amount of hardener (say 4 matchheads-worth) how long will the mixture be workable for, before it becomes too dry to work with? I know it depends on ambient temperature etc and so am not asking you to guess those factors. All I want is a range estimate of time of workability at, for instance, 20 degrees celsius in a dry climate. Hello Cameron, Builders Bog cures by a chemical reaction which consumes the volatile component as it cures – tying it up as a cross-linking agent in the chemical reaction. If you add insufficient hardener, this reaction will not go to completion and you will be left with a weak compound that still smells strongly of styrene monomer. We adjust the gel time of every batch to between 6 and 8 minutes art 22 Deg C. using 40 gram of paste and 1 gram of hardener. This is 2.5 % by weight and 1.9% by Volume. This is the ideal ratio for cure. You can go outside this and still obtain good cure, using from 1.1% to 5% by volume of hardener and this will vary the gel time. But 4 match heads to 250 ml will be about 0.25 ml. to 250 ml or 0.1%, which is far too little hardener. You can extend the gel time by putting the two components in a fridge first. Or use successive smaller fills one on top of the other. But you will not be able, at room temperature, to get longer than about 18 minutes working time before you spoil the cure. The whole concept of Builders Bog is that it is fast enough for a tradesman to complete a job and finish-paint it in a couple of hours. Whereas water-based or solvent based fillers take longer and longer to dry as the thickness of the fill is increased, Builders Bog does the opposite, so the thicker the fill the more chemical heat is given off and the faster it cures. Hi Greg, Firstly, I am sorry you had a problem with our product. The material is made in batches of 2000 litres and each one is checked for setting time and final cure and adjusted with chemical additions to get the right Gel Time and cure before packing off. It is not possible to have a “bad can” that is outside specifications and, as it ages over a period of 5 to 10 years, the gel time and cure time get shorter until the shelf life is used up and the stuff is then hard in the can. Therefore there are 3 ways the material can fail to set: insufficient hardener; too much hardener; or a chemical in the timber (such as metalex preservative, or some epoxies) which inhibits polyester cure. The latter will only spoil the bond to the timber but the bulk of Builders Bog will still cure OK. The smell you now have will be unreacted styrene, which is the cross-linking agent in our formula, and should all be used up by chemical reaction if proper cure took place. The only way to remove the smell barring waiting a long time for it to evaporate, which could take months or years, is to scrape it out and re do it using the correct amount of hardener as specified. If I were you, to satisfy myself, I would cure a small amount after careful measurement of the two components – and remember we give a huge permissible operating range for the ratio in the instructions – and observe that it set fully in about 20 minutes on a piece of scrap. Setting time depends on temperature, of course, and the thickness of the repair. 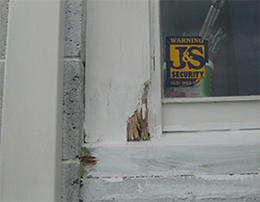 A thicker repair generates much more chemical heat (up to 80 deg. C or more) and will therefore cure faster and have a shorter “spreadable” and “cheese-grateable” time. You can also judge by colour and should see something like the pictures attached, depending on the colour settings of your monitor, of course. I hope this helps and again sympathise with your problem. I suspect you may have insufficient hardener in the mix, because on a bigger job one has either to work very fast or apply multiple layers. The gel time is set at 6 to 9 minutes at 22 deg. C so that a tradesman can complete a job, sand it and paint it in the same half day, unlike solvent based fillers which necessitate repeated visits on successive days due to the long drying times involved. The temptation is therefore to use less hardener to prolong the working time, and move outside the minimum ratio permissible for proper cure. Please feel free to contact me again if you have further worries or questions. Hi Steven, Yes you can use Builders Bog. Work it well into the concrete though, because it is primarily designed to bond chemically to timber (cellulose). It will not set any harder than a soft wood though – nowhere near as hard as concrete! To make it look like concrete you can sprinkle some cement powder or sand/cement mix on top before it sets and then brush away the remainder after it has set. Hi, I want to inject some Bog into a cavity left within a timber balcony post. Is there an way to thin the mix (with a minimal amount of hardener) so that it won’t clog the syringe. 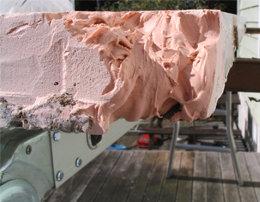 Hi Bill, Builders Bog could be thinned by adding polyester resin, but you need the resin used with BPO hardener not the MEKP hardener boat and other common fibreglass resins use. And this will probably be impossible to buy in less than drum lots! You cannot use solvents – there are no actual solvents in Builders Bog (hence the lack of shrinkage when it cures). The cross linking agents in Builders Bog will dissolve the piston in most syringes, so I would not try this method. An “ícing bag” – disposable polyethylene bag full of Builders Bog with one corner cut off to squeeze out the filler -works OK, but Builders Bog is too thixotropic (anti-slump) to inject effectively. All in all this is not very encouraging, but when we want to fill a deep hole we push the stuff in with a small spatula, and this always works. I have attached some photos of the repair to a rotted mortise and tenon joint on a French door done many years ago now. The cavity here was about 4 inches deep and the repair quite simple and very quick. The whole set of photos shows how the abuilders Bog was put in, in about 5 stages (5 mixes that is) to give plenty of time to work each lot into the cavity. Your post may be quite different from this, but I hope this helps. I am out of the office until Thursday, so I have copied this email to other staff, so you don’t get too many other replies in my absence! Hi Steve/Anne, This is a tricky one, since we made Builders Bog very thixotropic fot the intended purpose and you need to remove or lessen this property. The only diluent that will work is an unsaturated polyester resin promoted for BPO catalyst. Most “fibreglass” resins are promoted for MEKP catalyst and may or may not work depending on the promoter used. You could try this, but I cannot guarantee success. A potential source of his resin is a car repair fibreglass resin kit from Repco or similar shops. 1. Use a specific number of mls. instead of a ‘matchbox’ and mark these on the mixing container with a line. 2. Instead of describing small measures in parts of a teaspoon, which are very difficult to measure, fit a dripper mechanism into the spout and describe the quantity by the number of drops to use. Some products in Australia use such measurement devices which makes them easier to use and therefore easier to sell. Dear Sir, Thank you for your feedback and suggestions. User-friendly measurements are indeed a problem, and we will see what we can do. Since the red hardener is a viscous paste, it will not “drip” like the older, dangerous liquid hardeners. It just extrudes like spaghetti. We used to give the number of mls. and got thousands of enquiries about how to measure these without ruining measuring cylinders. The mls. ratio is 1.5 to 3.5% by volume or at the mid point 5 mls hardener to 200 mls paste. 1 ml. on the mixing container is only a depth of .07mm – impossible to estimate, even if you could spread the hardener out evenly. I will give this some more thought. Hello Stuart, Many thanks for your reply. It’s heartening to know that feedback has at least been read and considered. Your comment about the hardener extruding like spaghetti was also useful because mine didn’t. It came out more as a liquid and was empty before I was able to do a third mix and still had something under half a tin of paste left. I nearly threw the container away in disgust but after reading your comment I have since found a thicker product in the bottom which will only squeeze out. Perhaps I should have shaken the container first although there was no suggestion that I should have done that. If it had come out thicker originally a small amount may have been easier to measure using a teaspoon. My mixing container now has two rings marked around it – one at two matchbox height and one at four. I realise that this would not work for the hardener because of the smaller quantity used. Once again thanks for responding – it is appreciated. Hello Peter, Thank you for your enquiry. 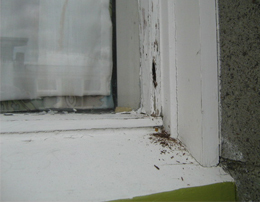 The type of anti-rot products referred to are “Metalex” and similar. They are copper or calcium naphthenates which stop the curing process where the Builders Bog contacts them. Earles wood hardener sounds different, though I cannot get it in New Zealand where we manufacture, so I have not checked it out. The beam is structural, I presume, and if there is so much rotted, papery timber that you cannot remove it all and bond the Builders Bog to remaining solid timber, I would be concerned about structural integrity. Builders Bog should only be used for cosmetic and weathering purposes. It will not impart new strength to a beam. Nor can Earles hardener, I am sure. It looks to be a water-based product from their web page. 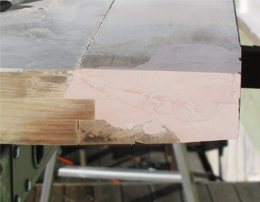 Even epoxies will not give tensile strength to to underside (tension side) of a beam, unless carbon fibre or similar is bonded on as well. The area size is not a problem, and we have used up to 12 litres in single repairs ourselves. But only for non-structural window frames and sills etc. Don’t hesitate to ask further questions of us if you need to. Hi Stuart, Thank you for your reply and advice, we purchased the large tin, 1L I think. Patch the builder bog in. The first batch dried too quickly, so we use less of the hardener. Overall, everything went well. We also bolted in another beam onto the no rotted timber. The only trouble is that the bogged area have some cracks, ranging from hairline to about 2mm, not sure why. Should be buy some more builder bog to cover the cracks or just sand and paint? Hi Peter, I am a bit concerned about the cracks. Builders Bog will never crack due to shrinkage. Are you sure your rotten beam has not flexed with the load on it and stretched the filled area? Remember, in a normal beam the top is under compression (ie the opposite of stretching) and the bottom is under tension (ie stretching). Did you jack up the rotten beam a bit to take out any sag before bolting the new one to it, to ensure the load is being taken mostly on the new beam? Did this cause the cracking – if and when the jack was released? I have no other explanation. You can certainly refill the cracks, but I would want to be sure they have not been caused by excessive load and stretching of the old beam. Hi Stuart, Once again, thank you very much for your prompt reply. Wish companies in Australia are like you guys, Great work. These are the steps we’ve taken. 1. Removed as much rots as possible and let it aired. 2. Jacked up the top decking timber and put the new supporting beam flushed against the side and top of the existing beam. 3. Put in the bolts and remove the jacks. 4. Spray in the timber treatments as per previous email and let it air for about 2 weeks. 5. Check for any rots and remove any loose debris. 6. Filled the gaps, rotted timber, with builder’s bog and let it dry for about 2 days. 7. The fill looks dried but still feel little like hard plastic, can push little in and can still smell the bog. 8. I did jumped, oops, on the top timber a few days later, to test if the new beam and bogs are good as we will have some guess coming over. 9. My wife notice the small cracks the day after and i notice the bog are not not flushed against the timber by about 1mm. Could be from the flex of the timber as we had some rain and then some hot days. So, not really sure what to do next. The cracks has settled and seems to stay the same size. Maybe should jump on it little more before our next bogging. Please advice.